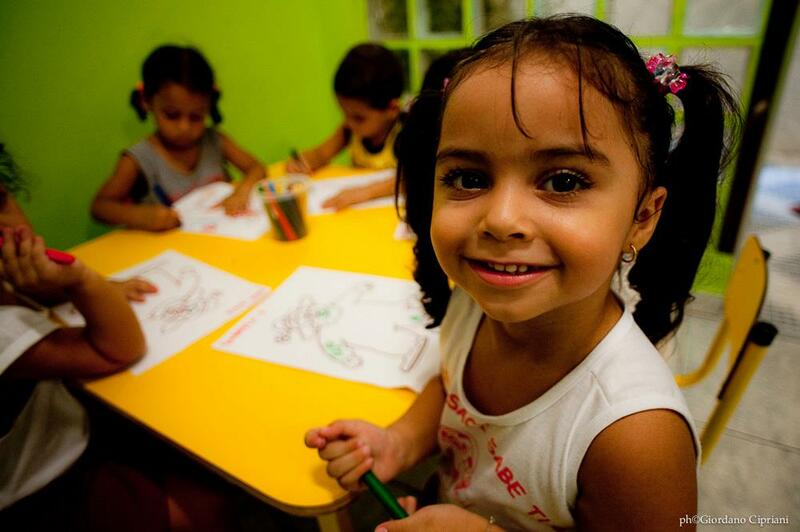 The nursery school “Saci Sabe Tudo” promotes culture, art and sports to the extent of developing opportunities which may turn children’s potential into tools for life, thanks to innovative methods aiming to learning and social transformation. With a skillful and professional team, “Il Sorriso dei miei Bimbi” has created a pleasant and relaxed environment where the study of topics such as life, peace and nature is priority. The school educational method includes the participation of parents and the whole Community in the educational process. The school at present welcomes up to 100 children in pre-school age. Most of them receive scholarship guaranteed by SAD programme – Sostegno a Distanza (Support at Distance). Children going to the nursery school are all aged between 2 and 5 years and a half and they all come from the favela; lots of them live in extreme poverty conditions. A first goal is thus provide them comfort and a different life perspective. Pupils are divided, according to their age, into levels – from 1st to 3rd level and, at the end of the programme they all have some literacy skills, are able to count, know colours and simple and complex words. This will help them enter elementary school. Furthermore, the school organizes educational trips to places of natural or cultural interest or playtime (zoos, parks, museums, theatres) to give them the opportunity of making new experiences outside the favela. The history of the institution coincides with the first meeting of Barbara Olivi and Veronica Brasil in the favela of Rocinha, in Rio de Janeiro. In 2002 Barbara founded, along with her family, the non-profit organization “Il Sorriso dei miei Bimbi”. Her goal was to financially support children in poverty in the favela. Veronica gave lessons at home and she dreamt of a real school for her pupils. Employing with regular contract people working for the non-governmental organization. Support to governmental or private campaigns which aim is to improve the quality of life of the children and their families. To stir up Community voluntary participation. At the end of the nursery school’s educational project children will be ready to enter elementary school, supported by developed skills such as art, music and sports, learnt by playing, singing and enjoying themselves. “Saci Sabe Tudo” represents the social-cultural context in which the school operates. Saci is a character of Brazilian children literature, created by novelist Monteiro Lobato, who lived between the end of 1800 and 1950. Lobato was a rebellious writer who believed in Brazil’s emancipation and who often acted against North-American interests. He began to write novels for children in 1921, he created the “sitio do Picapau amarelo”, an imaginary forest populated by strange characters, humans and animals. Saci was among them. Saci is a real pest, a rebel who pours salt in granny’s soup, who adds hot chilly pepper to his neighbour’s salad. He is a black child with only one leg. The methodology of the Saci Sabe Tudo School is based on constructive proposal. The goal is to guide children and let them explore and discover all the possibilities of the human body, of objects, of relationships, their surroundings and to develop in this way observation, research and reasoning skills. In children’s education, pupils’ learning process takes place only by developing biological, psychological, intellectual and sociocultural aspects; children learn through different ways the importance of preventing illness, safeguarding nature and animals, of respecting their fellows and increasing their knowledge. That is the reason why we wish to reach their families and the Community. Children are taken to visit different places such as natural heritage sites, parks, other social projects, exhibitions (to stimulate creativity and social integration), including showing of documentaries about health, environment and civic education. At this stage they take part in activities helping their physical, social and psychological growth. Their oral skills are stimulated through novels, plays and games, always respecting personal characteristics and differences. At this stage our aim is to develop the most important basic concepts such as sense of direction, time control, rhythm, motor coordination and the use of language as means of communication. The goal in this phase is to reach children’s complete development through a harmonic evolution of biological, physical, cognitive, emotional aspects, paying particularly attention to motor coordination and basic writing skills. We try to develop language skills as means of communication and reasoning through the study of basic concepts of civic education, mutual respect, cooperation and collaboration with other pupils and teachers. These concepts are as important as love for nature. Furthermore, thanks to simple concepts and specific teaching material we develop logical and mathematical reasoning. At this stage our goal is to complete children’s biological, psychological and cognitive development. More and more importance is given to coordination of movements, writing and literacy skills. To this extent children are asked to write words, connect letters to sounds, divide and visualize syllables. This also helps logical- mathematical reasoning and counting skills.